From time to time during the season, we took a look at the 2009 attendance to see how the 2009 season stacks up against last year and whether the Rays were able to reach their goal of being average (in attendance). The Rays drew 1,780,791 fans for 80 home games in 2008 (22,259 per game). That was the most since their inaugural season of 1998 when they drew 2.5 million. The Rays goal for 2009 was league average which was 2.6 million in 2008 (the median was about 2.5 million). 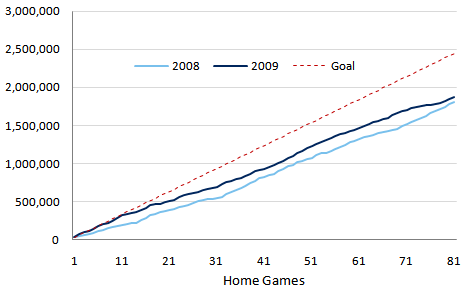 League average this season was 2.45 million (red line above) with a median of 2.32 million. The Rays would have needed to average 30,191 to reach league average and about 28,681 to reach the median. This season the Rays averaged 23,148 in 81 games. That marked an increase of 4.0% over last year. The Rays 1,874,962 tickets sold ranked 23rd, up from 26th in 2008. I'm sure it is disappointing to the owners, but I still think its a move in the positive direction. The Tampa Bay market has proved to be finicky when it comes to attendance, and sustaining competitiveness will lead to a continual trend upward in attendance. While I still subscribe to the theory that attendance would markedly improve by moving the team across the bay, I still believe that there is room for growth while still in Pinellas. I think its entirely possible to average attendance in the upper 20k's, and believe the Rays will eventually achieve that, but that it may take another year or two and an upward tick in the local economy. W/ the lack of winning by the Bolts and Bucs people will realize the Rays are the best thing going for this area, and have been for the last year. Next years team will be a good squad, but still the Rays deserve better then what they getting from the Bay Area. Congratulations Rays owners in another increase in 2009!! But you still continue to show increases...good job! can follow the Bucs path! Next year attendance will be up again! Book It! I never said the attendance wouldn't go up next year. The team certainly still has room to grow in Pinellas. I just believe that it makes the most sense to have the team where a majority of the area's population is. Also, in case you hadn't noticed, when the Bucs actually put a decent product on the field its the hardest ticket in town to get. I don't know why that would be a bad thing. The Rays have steadily grown a business the last 3/4 years after being a loser for 10 years! be operating in (although N. Pinellas would be a better location)? The Bucs had a season ticket waiting list of over 100,000 for quite a few years (some leading into the Super Bowl run and some following it). The Tampa Bay market has shown to have accountable fans. They will only regularly go to sporting events for teams they feel are whole-heartedly trying and have a chance to do something. And I still think the Rays can be successful in Pinellas, I just think they would be even more successful on the side of the bay where the vast majority of the population is (that is just simple logic).